An artificial beach will be set up in Seoul Plaza this Friday and Saturday. The Seoul Metropolitan Government came up with the idea to bring some respite for Seoul residents who are exhausted by this summer's endless scorching heat. The manmade mini-beach was inspired by Paris Plage, a temporary artificial beach that opens every summer along the river Seine in the French capital. A total of 15 tons of sand will be brought in from Incheon, along with palm tree-shaped balloons and parasols to temporarily turn Seoul Plaza into a beach. Tents, sofas and mosquito nets will be set up in the grassy area for people to rest and enjoy movies outdoors. "The Running Actress" directed by actress Moon So-ri will be screened on Friday, and "Butterfly Sleep," a Korean-Japanese co-production slated for release in September, will be screened on Saturday. 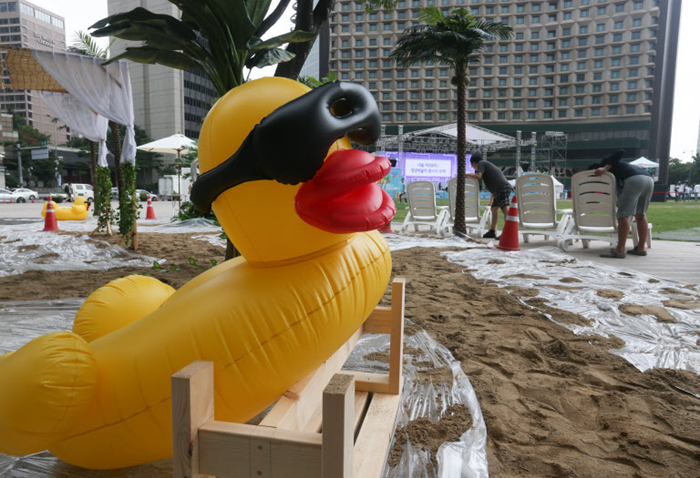 Workers set up a temporary artificial beach at Seoul Plaza in the capital on Thursday. There are 80 mosquito nets available per day, which can be borrowed for free on the site. Meanwhile, Gwanghwamun Plaza will be transformed into a winter wonderland featuring snow sculptures and a large Christmas tree. Over 150 snow sculptures will be on display from 6 p.m. until midnight on Saturday. "We will have a giant Christmas tree standing 6 m high, so hopefully people will be distracted from the sweltering heat," said a city official.